In 4.8.3 when painting foliage, it now sees other foliage actors as static meshes and will paint on itself which is very annoying. This didn't used to happen in earlier versions. Does this occur in a blank project with no additional content or is it limited to one project? Are you painting foliage on top of procedurally generated foliage? Is it limited to one mesh or does this occur with meshes from the starter content/other meshes? Hi Adam. Currently its happening in my custom project. Haven't had a chance to try it in a blank project but I'll let you know. I'm painting foliage only. 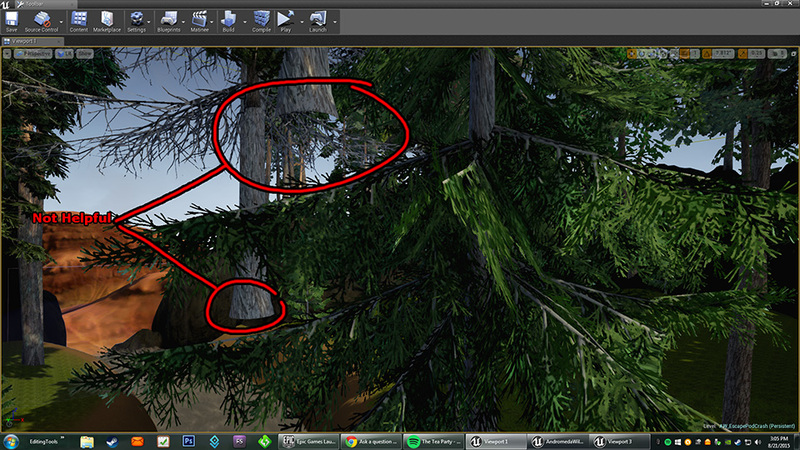 Its happening with all of the speedtree meshes that I purchased from the Speedtree store and imported to the project. Does not seem to be happening with other static meshes that I have imported. In fact with further testing it seems to only be happening in that one map. Not sure how to fix it but at least it doesn't seem to replicate in other maps. Have you been able to reproduce this anywhere else as of yet or is it definitely limited to this map? What are your foliage settings set to? Hi Adam, Haven't been able to reproduce it outside of the one map although I haven't really had time to try much more than just hitting File - New and trying a quick paint as I've been really focused on other aspects of my project. Trying to hit a self-imposed Kickstarter deadline. I'll let you know if it comes up again but I supposed for now we can consider it an occasional glitch and close the issue. Thanks for the help! I understand completely. I'll go ahead and mark this as accepted for tracking purposes. If the error does occur again please post here with updated repro steps and I'll be happy to take another look. Good luck with your kickstarter! I had the same problem and I believe it is caused by the collision. I had my collision presets set to "block all" When I revert it back to "no collision" I no longer have the problem.